The Liberty announced Monday that Zahui B re-signed with the team on an unspecified contract. A restricted free agent, Zahui B wasn't extended an offer sheet by any other teams and will ultimately remain in New York for a fourth straight season. The reserve post player is coming off a campaign in which she averaged a career-high 7.7 points while chipping in 3.0 boards in 15.9 minutes per game. Zahui B (hip) has been ruled out for Sunday's game against the Mercury, Pat Ralph of WNBAinsidr reports. Zahui B finishes the 2018 campaign with five straight absences, though some of those were likely just precautionary considering the Liberty had already been ruled out of playoff contention. Still, Zahui B arguably had her most productive season to date, finishing the year playing in 29 games and averaging 7.7 points and 3.0 rebounds across 15.9 minutes. With Shavonte Zellous (ankle) and Epiphanny Prince (knee) also out Sunday, there should be slightly boosted workloads across the entire roster. Zahui B (hip) is sidelined for Friday's matchup against the storm, Pat Ralph of WNBA Insidr reports. Zahui B has been sidelined since Sunday due to a hip injury and remains without an official timetable for a return. Her next chance to play arrives Sunday against the Mercury, which is New York's final regular-season tilt. Zahui B (hip) is out for Wednesday's game against Las Vegas, Andrew Joe Potter of The Score reports. Zahui B was also ruled out for Tuesday's game, with 24 hours not being enough time for her to recover. While she remains sidelined with the hip injury, Tina Charles and Kiah Stokes are candidates to see additional run. Zahui B (hip) will not play Tuesday against the Sparks, Andrew Joe Potter of The Score reports. Zahui B was previously listed as doubtful for the contest, so this news isn't out of the blue. In her stead, Kiah Stokes and Tina Charles should see extra workload. Zahui B (hip) is listed as doubtful for Tuesday's game against the Sparks, Geoff Magliocchetti of Elite Sports NY reports. After sitting out this past Sunday with a sore hip, Zahui B has been upgraded to doubtful for Tuesday. While the doubtful designation means it's unlikely she'll play, it is a step in the right direction after missing Sunday's contest. If she is unable to go on Tuesday, her next opportunity to play will be Wednesday against the Aces. Zahui B (hip) has officially been ruled out for Sunday's matchup with the Dream, Geoff Magliocchetti of Elite Sports NY reports. Zahui B has been dealing with a sore hip over the last few days and ultimately felt as if the pain was too much to play through Sunday. She'll join the likes of Epiphanny Prince (knee), Marissa Coleman (ankle) and Shavonte Zellous (ankle) on the sidelines, leaving the Liberty with some depth issues across the board. At this point, it's unclear if Zahui B will be able to make it back for the team's upcoming back-to-back set on Tuesday and Wednesday. Zahui B is dealing with a sore hip and is listed as questionable for Sunday's game against the Dream, Geoff Magliocchetti of Elite Sports NY reports. This is the first we've heard of the injury, but it now brings Zahui B's status into question ahead of Sunday's contest. Look for another update to be provided following pregame warmups, though the Liberty could really use the extra body. The team is already without Epiphanny Prince (knee), Marissa Coleman (ankle) and Shavonte Zellous (ankle), while Kia Vaughn (Achilles) remains questionable. Zahui B had 17 points (8-13 FG, 1-2 3PT) and 11 rebounds in Monday's loss to the Storm. Zahui B was one of the few bright spots for New York, which trailed by only one entering the fourth quarter but was outscored 35 to 20 in the final period. It was Zahui B's first double-double of the season and also the first game in which she registered more than eight rebounds. Zahui B dropped 14 points (5-7 FG, 1-2 3Pt, 3-4 FT), two rebounds, one assist, one steal and one block during the Liberty's 92-77 loss to the Sun on Wednesday. This was the second straight game in which Zahui B scored in double figures, as she reached the 14-point mark while shooting a decent 71.4 percent from the field. In addition, the former Minnesota standout also recorded at least one tally in every major statistical category Wednesday. Over 26 outings currently, the 25-year-old is contributing a career-high 7.3 points per contest. 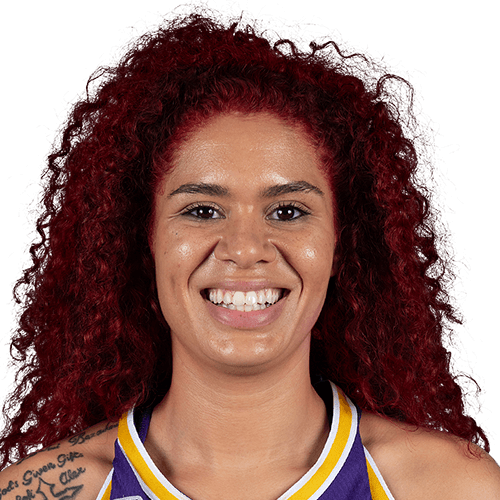 CAREER TRANSACTIONS: Selected second in the first round (second overall) by the Tulsa Shock in the 2015 WNBA Draft… Acquired from Dallas along with a 2017 second round pick in exchange for New York’s first round draft pick in 2017. Drafted second overall by the Tulsa Shock in the 2015 WNBA Draft. Scored a career-high 17 points against Minnesota on June 29, 2016. Shot .333 percent from 3-point range during rookie season. Career-best five blocked shots against San Antonio on June 14, 2015. 2017: Appeared in 29 games for the Liberty… Averaged 2.2 ppg and 1.1 rpg… Came off the bench to score a season-high 8 points. Also managed a season-high 6 rebounds in win over Chicago (8/27)…Knocked down a bucket for 2 points and 1 rebound in win against Indiana (8/23)…Matched her season-high with 7 points. Set a new season-high with 4 rebounds at Los Angeles (8/4)…Finished with 5 points, 1 rebound, and 1 assist at San Antonio (8/1)…Scored 2 points and pulled down 2 rebounds against Washington (7/16)…Posted her first 3-pointer of the season against Chicago (7/14)… Finished with 2 points and 1 rebound against Washington (6/29)…Recorded a season-high 7 points off the bench; also had 2 blocks and 2 rebounds against Dallas (6/16)…Scored a season-high 6 points and had 1 block against Connecticut (6/14)… Against Seattle had 1 assist, 1 rebound, and 1 steal (6/11)…Tied her season-high in scoring with 4 points in win over Atlanta Dream and also recorded her 1st block of the season (6/7)…Played for 8 minutes and pulled down a season-high 2 rebounds against Phoenix (6/4)…Scored 2 points and had 1 rebound against Dallas (6/2) …Played for 2 minutes in game versus LA (5/30) …In first road game, had 1 rebound and 1 assist against Phoenix (5/23) … Scored 4 points in the second half of the game against the Stars, also had 2 rebounds (5/13). 2016: Appeared in 33 games making 1 start… Averaged 5.0 points and 3.2 rebounds per game… Finished the season ranked 24th in the WNBA in blocks (0.7 bpg)… Had 6 games scoring in double figures… Reached double-figures with 10 points (4-7 FG) in a home win over Connecticut (9/9)… Finished with 8 points and 5 rebounds off the bench in 21 minutes of action against Indiana (9/1)…Scored in double figures for a 5th time, finishing with 15 points (6-of-12 FG) and 9 rebounds with a pair of blocked shots in a win at Washington (7/20)… Racked up 9 points and 3 rebounds off the bench in New York’s win over Atlanta (7/13)… Paced the Liberty with 14 points (6-of-9 FG) along with 4 rebounds off the bench in New York’s 10-point win over the Stars (7/10)… Made her first-career start and thrived, scoring a career high 17 points while matching her personal best with 9 rebounds, and was a team-best +14 in New York’s overtime win at Minnesota (6/29)… Grabbed a career-high 9 rebounds and scored 6 points in New York’s overtime loss to Phoenix (6/26)… Scored 6 points with a 3-pointer and blocked 2 shots in the Liberty’s win over Chicago (6/24)… Poured in 10 points and hauled in 8 rebounds in the Liberty’s contest at Los Angeles (6/7)… Drained a 3-pointer and shot 3-of-6 from the field to finish with 7 points in a win over Indiana (6/3)… Scored 10 points and was a perfect 6-for-6 from the free throw line in the 2016 home opening win over the Dallas Wings (5/15)… Made her New York Liberty debut in the season opening win at Washington (5/14). 2015: Appeared in 31 games for the Tulsa Shock…Averaged 3.4 points per game, 2.4 rebounds per game, and 9.7 minutes per game…Had a career-high five blocks at San Antonio on June 14, which ties the Tulsa Shock record for most blocks in a game…Scored a career-high 15 points against Phoenix on September 19, including a career-high three point field goals made with three…Also recorded career-highs with eight total rebounds, four assists, and twenty minutes played on September 19…Grabbed a career-high six defensive rebounds against San Antonio on June 16…Ranked sixth among all rookies in blocks per game with .6 blocks. PRO OVERSEAS: Played for Adana in the Turkish League during the 2015-16 season… Played for Orenburg in the Russian Premier League in 2016-17 while also competing in EuroLeague women where she helped guide the team to the quarterfinals… Competed with USK Praha in the Czech League and EuroLeague Women in 2017-18.
INTERNATIONAL: Member of the Swedish Women’s Basketball National Team. COLLEGE: Played three seasons for the Minnesota Golden Gophers … Big Ten Player of the Year as selected by the media (2015), Naismith Trophy Finalist and Wade Trophy Finalist (2015), First in program history to be named an AP First Team All-American (2015), Academic All-Big Ten (2014, 2015), Big 10 All-Defensive Team (2014, 2015), All-Big Ten First Team (2014,2015), Big Ten Freshman of the Year (2014) … Holds the school records for overall blocks (204), blocks per game (102) and blocks in a season (105) … Averaged a career double-double with 16.9 points per game and 12.2 rebounds per game … Holds the Big Ten single-season record for rebounds (394) … In 2015, she recorded the second triple-double in the Big Ten Tournament’s history after posting 25 points, 11 rebounds and 11 blocks in the quarterfinal round … Was named to the 2015 Big Ten All-Tournament Team after averaging a double-double (23 points and 11 rebounds) for the tournament … During her sophomore year (2014-2015), she set NCAA bests for rebounds in a game (29), blocks in a game (12) and shooting percentage in a game (100 percent from the field) … One of only three players in the NCAA to post two triple-doubles on the season … With 426 total rebounds, she set Big Ten and Minnesota single-season records for the second consecutive season … Set Minnesota single-game records in field-goal attempts, field-goal percentage, rebounds and blocks … Became the record holder for rebounds (427) and blocks (140) at the Golden Gophers’ Williams Arena … Named to the espnW All-America First Team, the USBWA All-America Team and the John R. Wooden Award National Ballot. During her redshirt freshman year (2013-2014), she was one of only two freshmen in the NCAA to receive a WBCA All-America Honorable Mention … Averaged a double-double with 15.4 points per game and a conference-best 11.5 rebounds per game in conference-only games … Named Big Ten Freshman of the Week seven times and Big Ten Player of the Week four times … Recorded the program’s fourth triple-double in history after earning 11 points, 11 rebounds and 10 blocks in a game … Redshirted her true-freshman year (2012-2013). PERSONAL: Born on Sept. 8, 1993, in Stockholm, Sweden … Daughter of Annso and Alex Zahui Bazoukou … Has a younger brother named Aaron … Lived in Spain and France before moving to Stockholm, and Alex lived in his native country, the Ivory Coast, before moving to Sweden to pursue a career … Amanda began playing basketball after first experimenting with tennis, field hockey, soccer and circus classes as a child … Moved into her own apartment at 15 years old to attend a school where her basketball development would be most benefited … 2012 graduate of Igelstavikens Gymnasium … Named Rookie of the Year (2010) and Center of the Year (2011, 2012) while playing in Sweden … Has played on Sweden’s national team since she was 13 years old … Considered playing for the University of Washington and the University of Louisville but chose Minnesota because, “It just felt like home.” … Plays video games, car games in particular, as a hobby … Would attend Martin Luther King Jr.’s “I Have a Dream” speech if she could go back in time.